Notice the two different colored bricks on the Fort. The lighter colored bricks used to construct the bottom two thirds of the Fort came from the Confederate states. When the Civil War broke out, southern brick merchants felt it foolish to supply the Union with bricks to build a fort designed to blockade Southern shipping lanes! The reddish bricks on the upper third of the Fort came from the Union states! Dry Tortugas is located 70 miles west of Key West, FL. Access to this park is either by boat or seaplane. There are no services on the island, so visitors must plan to bring everything they need with them. The NPS has contracted with concessionaires to provide transportation to and from Fort Jefferson. When to visit: The winter season (Nov. thru April) is influenced by cold fronts that create strong winds and large swells. Summer (May thru Oct.) coinciding with Hurricane Season. Benefits of a winter visit – cooler weather, lighter crowds. Benefits of a summer visit – ideal weather and excellent visibility for snorkeling. What to do: Most visitors come to tour Fort Jefferson; however, camping, snorkeling and diving about the coral reefs, world class bird watching, kayaking and canoeing are among the many other activities available to visitors of Dry Tortugas. Where to stay: There are no lodges or hotels at Dry Tortugas There is a 10-site primitive campground on Garden Key. Those campsites are let on a first-come, first-served basis. There is an overflow area in case a regular campsite is unavailable. Transportation for those wishing to camp at Dry Tortugas is limited to the Yankee Freedom Ferry. 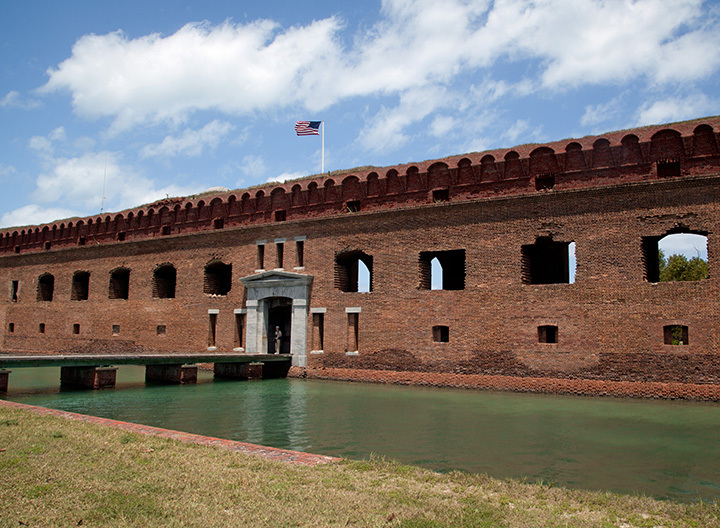 Bring a tent, as tents are required camping gear on Dry Tortugas! Since there are no facilities on the island, you will also need to bring food and beverage! teeming with hawksbill, leatherback and loggerhead turtles. He named the islands las tortugas. The 7 landmasses within the park boundaries receive an average annual rainfall of about 40 inches. Most of the rainfall comes during the hot summer months. Collecting and storing fresh water has always been a challenge. Because they lacked fresh water, early nautical charts indicated these keys to be “dry,” thus the name Dry Tortugas evolved.